Tags of all kinds, in combination with the location of fish capture if available, contain important information for researchers studying fish behavior and movement. Some tags even have rewards if returned! Be sure to call the phone number on the internal or external tag, if present. You are also asked to contact the Pa Fish Commission Biologist by calling the iTAG Hotline to supply vital research information and collect more information about your fish. What type of tag is it? 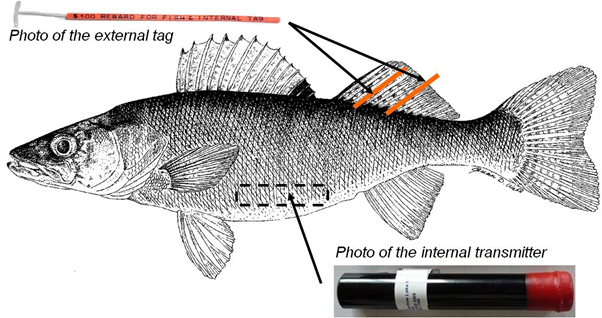 Common tags used in the Great Lakes basin include external tags, internal tags, and jaw tags. External “floy” tags are inserted along the spine, often at the base of a dorsal fin and contain a unique code number with instructions for reporting and returning. These can be either yellow or orange in color. Makes no difference. It's only to grab your attention. Internal tags are electronic transmitters and may contain important data with a reward if returned. 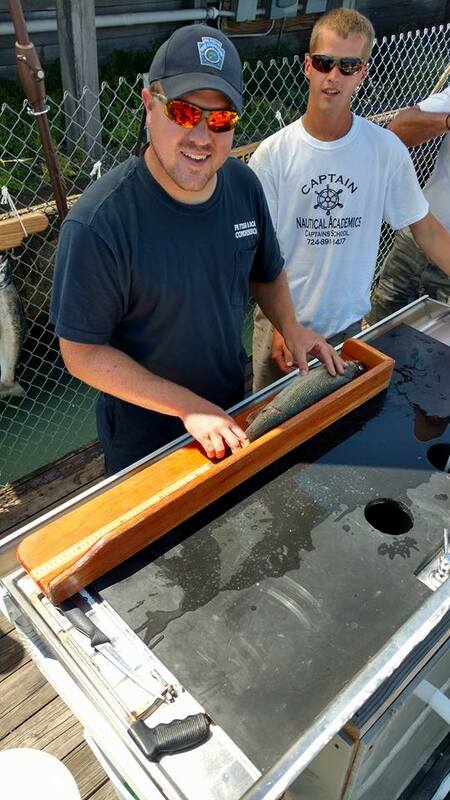 We prefer that you first call the iTAG Hotline and have the Biologist collect the data from your fish. The biologist will be glad to meet you when you come off the lake. Please DO NOT FREEZE and handle with care! If you haven't done so already, immediately remove the internal transmitters from the fish and rinse with water. Store the transmitter at room temperature. Contact the iTAG Hotline for how to return the tag. You may keep the fish for consumption. Note: Rewards are offered for the INTERNAL transmitter tags only! Jaw tags are metal tags attached to the jaw of the fish. Fish caught with a jaw tag should also be reported by calling the iTAG Hotline! What information can you tell me about the fish I caught? Jaw tags and Internal tags both hold interesting data about your fish. By reporting a tag, you can learn many things about the fish including its age, travel history, where and when it was tagged and much more! 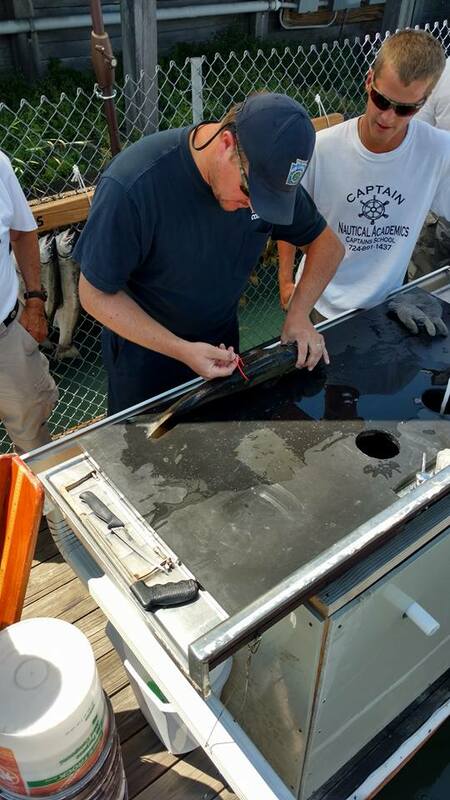 Biologist Mark Haffley of the PA Fish Commission inspects a tagged fish from Lake Erie. Here, you see the bright orange floy tag sticking out of the walleye's back. A sharp eye will see the tiny writing on the tag. Biologist Mark Haffley shows the INTERNAL tag taken from the belly of the walleye. A little larger than a AA battery, the internal tag is carefully removed from the gut of the walleye. Notice the reward info with phone numbers and important tag ID information. Treat these with care! We prefer that you call the iTAG Hotline first! Biologist Mark Haffley collects valuable data of the walleye. 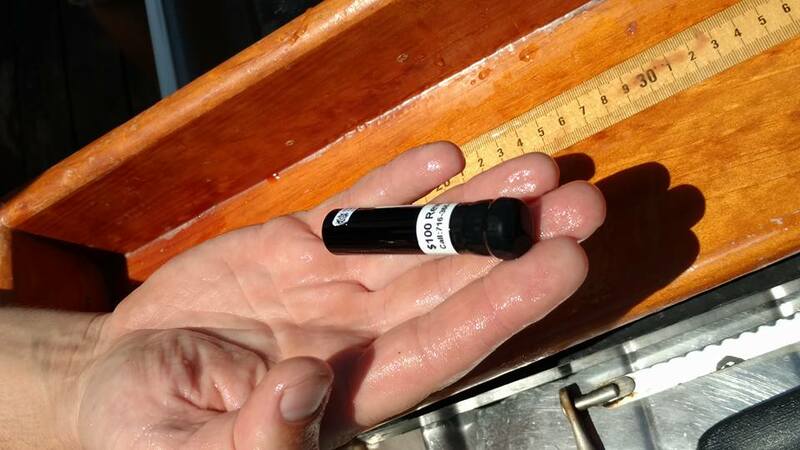 Several bits of data are taken such as length, weight and age of your host fish before handing it over for consumption.